Note: Living on a farm means you need to be versatile. Pork Roast in the freezer, fresh whole chicken from a neighbor or a lovely roast from one of our own. This recipe will work with ‘Almost Anything’! Pat meat dry with paper towels to remove any excess moisture as meat will brown better when they are dry. Season with salt and freshly ground pepper. Dredge meat in flour, shaking off excess. In a large Dutch oven pot, heat vegetable oil until smoking. Add meat to the hot pan and brown all sides, about 3 minutes per side. Remove and reserve. In the same pot, add the onion, carrot and celery. Season with salt at this point to help draw out the moisture from the vegetables. Saute until soft and translucent, about 8 minutes. Add the tomato paste and mix well. Return browned meat to the pan and add the white (or red) wine and reduce liquid by half, about 5 minutes. Add the bouquet garni and 2 cups of the chicken stock and bring to a boil. Reduce heat to low, cover pan and simmer for about 1 1/2 hours or until the meat is falling off the bone. Check every 15 minutes, turning shanks and adding more chicken stock as necessary. The level of cooking liquid should always be about 3/4 the way up the meat. Carefully remove the cooked shanks from the pot and place in decorative serving platter. Remove and discard bouquet garni from the pot. Pour all the juices and sauce from the pot over the meat. Garnish with chopped parsley. The French are known for their cuisine, and herbs play a huge role in that reputation. You, too, can cook like a French chef using the fresh herbs that you have been growing this spring and summer. 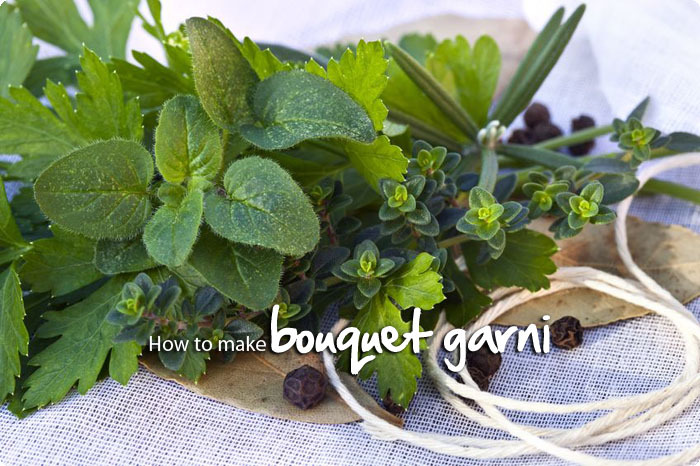 Create your own Bouquet Garni, and add the subtle flavors of herbs to any soup or stew. This bouquet combines the classic herbs: parsley, thyme, peppercorns and bay leaves to create a wonderfully aromatic base to any slowly cooked meal. You can add other herbs to alter the flavor – sage, basil, rosemary, or cilantro. Experiment and see what works for you and your own recipes. A bouquet garni imparts subtle herbal flavor to soups and stews we’re simmering throughout fall. The classic combination of parsley, thyme and bay leaves creates an aromatic base for savory, slow-cooked meals perfect for the season. Other whole spices and herbs may be added to the mix for additional flavor. Cut a 10” square of muslin cheesecloth, rinse in cold water and squeeze dry. Bundle the cloth and tie off with kitchen string, making sure that there are no gaps. Use the fresh bundle in your cooking, and remove before serving.